Duck Baker made his name as a preeminent fingerstyle guitarist in the folk/acoustic world, as one of several players of his age who expanded the fingerpicking repertoire from blues, ragtime, and Merle Travis-style instrumentals to include Irish and Scottish music, swing numbers and modern jazz. Less well-documented is Baker's free jazz - free improv style, something he began working on after hearing Sonny Sharrock in the 1960s. 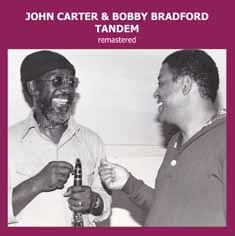 Baker's approach to this music was also heavily influenced by people like Eric Dolphy, Ornette Coleman and Cecil Taylor, and took another evolutionary turn in the mid-1970s when he heard Derek Bailey and, slightly later, began working with people like Eugene Chadbourne, John Zorn, and Bruce Ackley. Baker saw this as consistent with his involvement with traditional forms, noting that, for him, people like Albert Ayler, Elmore James and Roscoe Holcomb all played the same music. 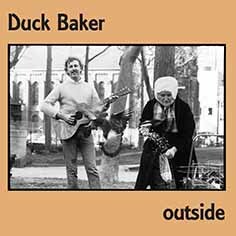 Apart from isolated tracks and one side of an early Eugene Chadbourne LP, this side of Duck Baker went undocumented on record until 2009. 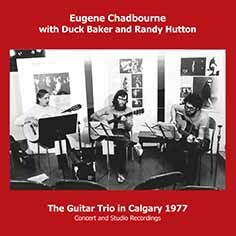 OUTSIDE helps fill in the blanks, with unreleased studio recordings made in Calgary in 1977, London in 1982 and Torino in 1983. A few of Baker's 'inside' arrangements are included for the sake of completeness, but most of the music is solo original pieces and free improvisations. 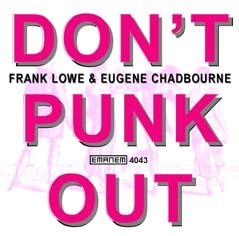 Also included are two very adventurous guitar duets with Chadbourne. 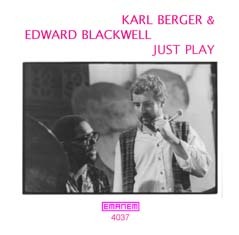 Hard-swinging vibraphone and percussion Free Jazz duets based on compositions by Berger and Don Cherry. In contrast to these largely metallic sounds, there are also two African-sounding improvisations on two instruments made from wood - a bala(fon) and an osi-drum. Reissue of Quark 9996 with an extra piece from the same concert. 61 minutes. 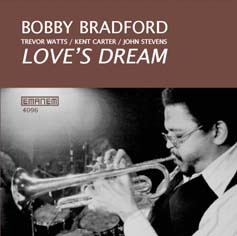 Hard-swinging Free Jazz recorded in a club in Paris, featuring original tunes by the vastly under-rated BRADFORD (cornet) with TREVOR WATTS (alto sax), KENT CARTER (bass) & JOHN STEVENS (drums). Reissue of Emanem 3302 with extra material. 77 minutes. All of two exceptional Worcester (Massachusetts) and Los Angeles concerts: clarinet & cornet duos & solos in improvisations on original compositions. Even those who know Carter & Bradford's work in larger groups will be astounded. The original CDs were the first (non-video) release of this duo performing unaccompanied, and the sound has been cleaned up considerably for this double CD set. 135 minutes - reissue of Emanem 4011 & 4012 with improved sound. 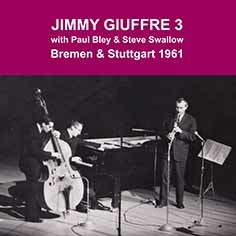 The Jimmy Giuffre 3 with Paul Bley and Steve Swallow only lasted about a year, but their work, which ranged from blues to tempo-less group improvisation, became a major influence on a wide variety of subsequent music from 'soft jazz' to 'hard-core' free improvisation. This double CD reissues their only known well-recorded concerts, originally released in 1992/3 on hat ART 6071/2. In addition, there are six previously unissued performances from the Bremen concert, three trios and three piano/bass duets. Also included are the two tracks from their FUSION album which were not included in the ECM double-album reissue. 158 minutes. A unique set of tenor saxophone and guitar duets mainly based on original compositions, with a couple of free improvisations and some pieces by other musicians. Considered by some to be among the best work of both musicians. Solo additions feature three Lowe pieces performed on a collapsing guitar in 1979, and some saxophone recorded in 2000. Reissue of QED LP 995 with extra later material. 65 minutes.